Feeding chickens sunflower seeds as a dietary supplement. 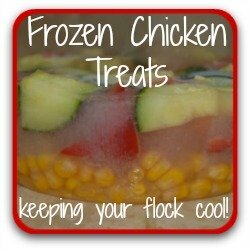 Looking for an easy, inexpensive way of providing your flock with a tasty, high protein supplement to their diet? Here's the answer - sunflowers! Here are links if you want to go quickly to a particular part of the article. They're joyful, they're a summer icon and an autumn treat, beloved of bees and a delight for children to grow. 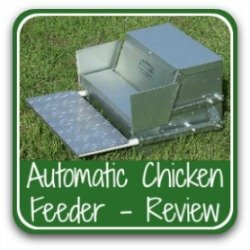 They're also a great way of giving your chickens a protein boost. There are two types of sunflower seed: black and striped. The black seeds are higher in their oil content - between 40 - 50%, depending on the variety. Striped seeds are larger, but contain only about 25% oil. The striped seeds are what's most often sold for wild bird and chicken feed. 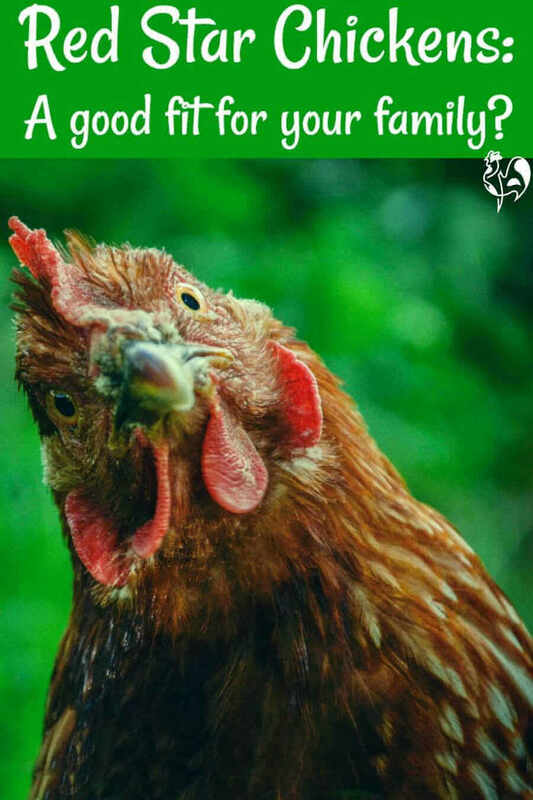 Which is why growing your own black seed varieties is much healthier for your flock - and more fun for you and your family. What makes sunflower seeds so good for chickens? Vitamin "E": known to be vital for the poultry immune system and a protector against diseases like coccidiosis, e.coli and bronchitis(1). 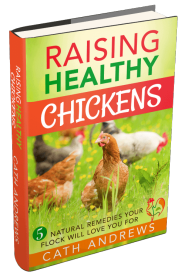 Protein: high levels of protein (around 26%) make this a great boost for chickens at times of stress such as moulting and cold weather. Oil: the high levels of linoleic acid(2 and 3) increases weight and sets chickens up for the winter months, and adds to the nutritional value (and weight) of eggs. Antioxidants: sunflowers are rich in natural antioxidants(4) - another boost to the the immune system. 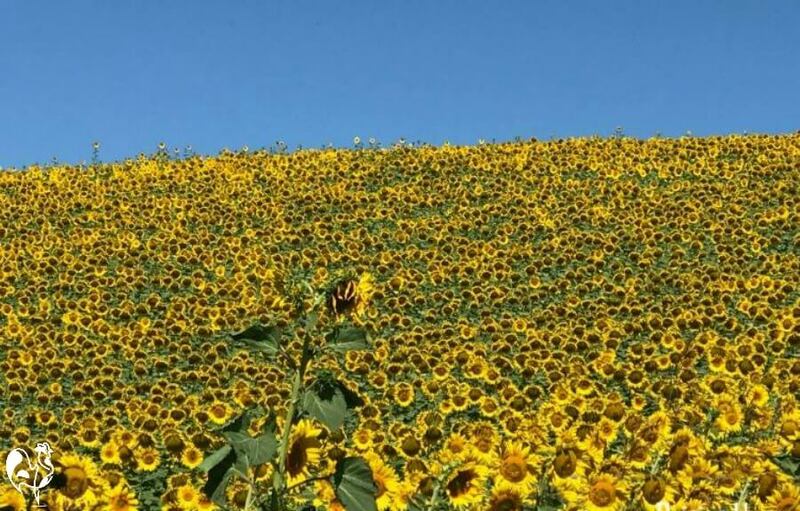 We're lucky enough to have this sunflower field right opposite our home in Italy. 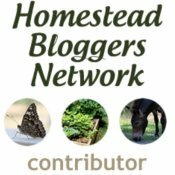 Is commercial sunflower seed as good? 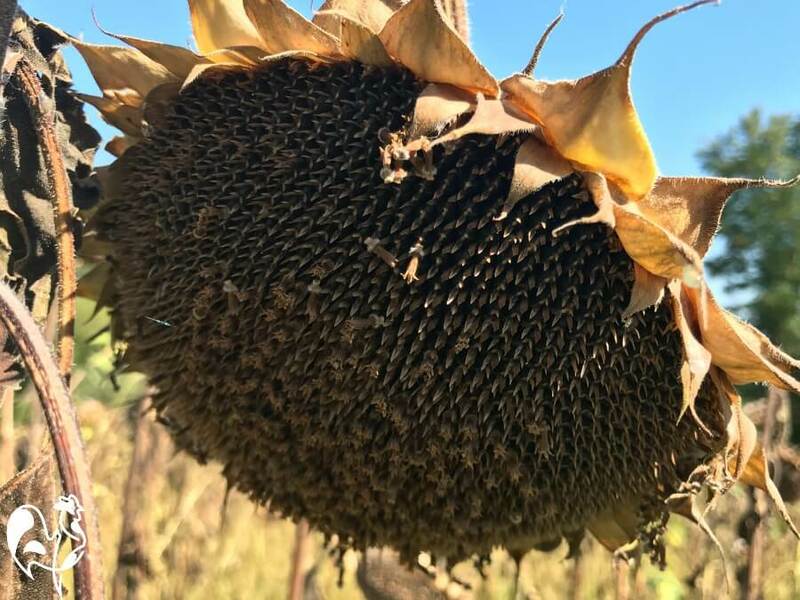 Sunflower seeds as chicken feed can be bought, but they tend to be the striped varieties which are less beneficial and some involve adding chemical in processing to give a longer shelf life. If you don't have space to grow your own, try to buy the black, rather than the striped, seeds for your flock. Make sure they're from a good supplier - some include parts of the woody stem and other debris in their packs. The seeds below are from a recognised supplier and of good quality. They're not for growing though, only for feeding! Sunflower meal is also available, but the processing decreases oil content to around 13% - some as low as 1%. 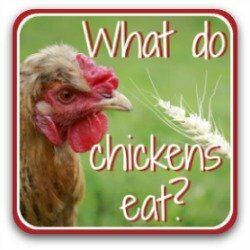 Can feeding sunflower seeds harm chickens? 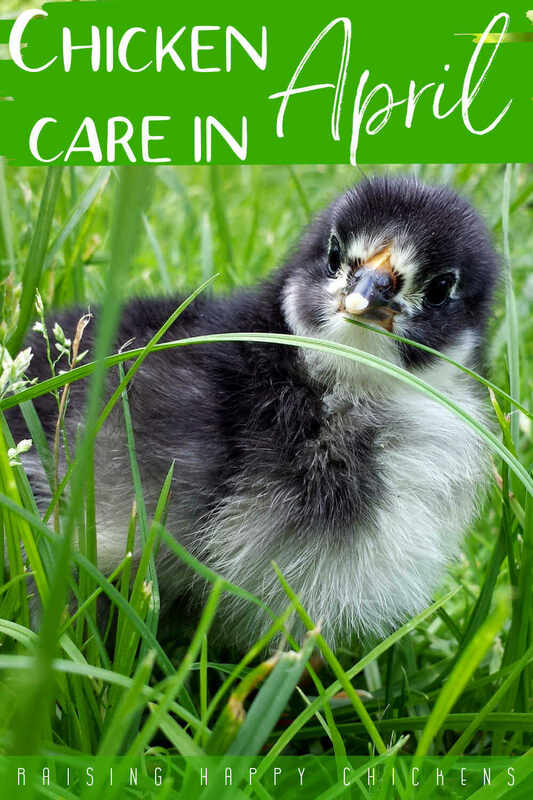 You may have seen information on the internet saying that sunflower seeds are bad for chickens. Here are some myths, and the facts about them. 1. Sunflower seeds make chickens' feathers fall out. This one probably came about because chickens tend to be fed sunflower seeds to help when they're moulting. So people saw moulting chickens being fed sunflower seeds, put 2 and 2 together made made 55. 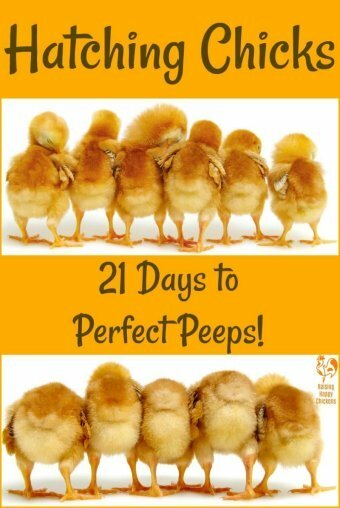 They're actually one of the best high protein foods and help with moulting. It's one of the best times to feed them to your flock. 2. They cause crops to become impacted. If you fed your flock nothing but, or a high proportion of, sunflower seeds and they had no access to grit, this might be a problem. 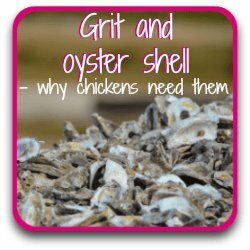 The answer is make sure your chickens have plenty of grit, either naturally or as a supplement, and do not over-feed. Use sunflowers as a treat. Sunny, bright, an icon of Italy, a summer delight and a great winter booster. 3. They make chickens fat. 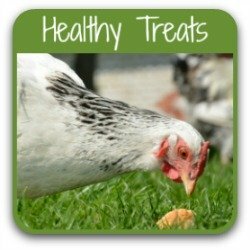 Again, if you over-feed sunflower seeds, or any other high fat food, your chickens will get fat. And fat is known to be a potential cause of sudden chicken death. 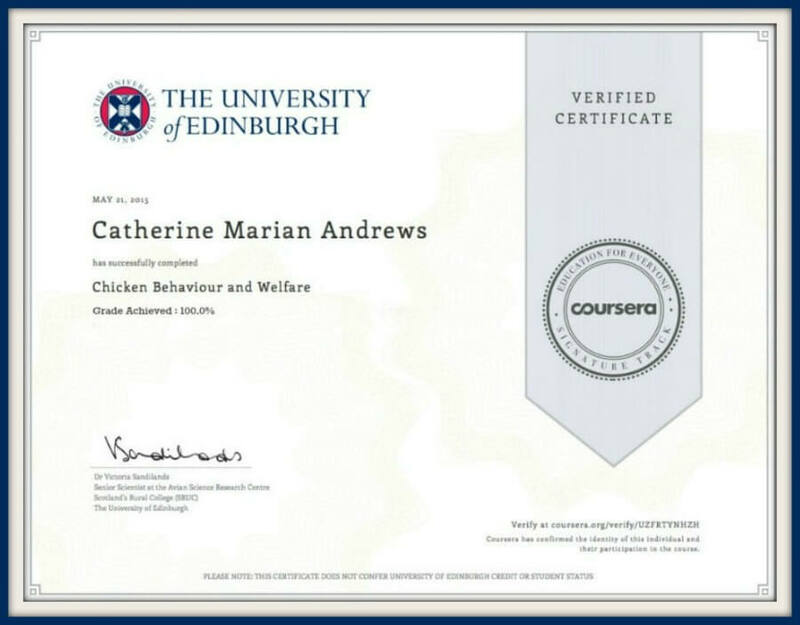 Feed as a treat, part of a balanced regime and only when chickens need it - when they're moulting, during particularly cold weather and at times of high stress such as after a predator attack. And do not feed every day.A handful of seeds between your flock every two or three days is plenty. Convinced? Great! Let's get started! When we first moved to Italy, I had no idea there was such a huge range of sunflower varieties. There are early and late crops, different sizes and different colours. Buy non-GMO varieties wherever you can. This is a selection of those I've found most useful, which attract honey bees when they flower - another great reason to plant your own - and are fun to grow. A dwarf sunflower growing in a pot outside our house in Italy. 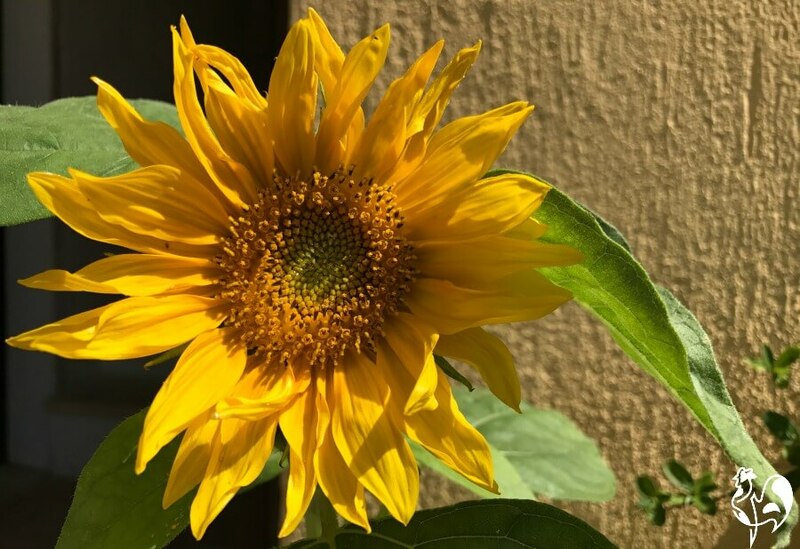 These are excellent to grow in small spaces, and great for little children as the sunflower head is low enough for them to get a good look at the developing seeds. The head (where the seeds grow) are quite large, so you'll get plenty of seeds for your money. These are really, really fun for kids to grow. They're huge! - between 6 and 10 feet tall, with flower heads measuring as much as 20" (although the average is more like 10" - still very large!). The head of a giant sunflower - common in Italy. Great for bees, great for seeds! 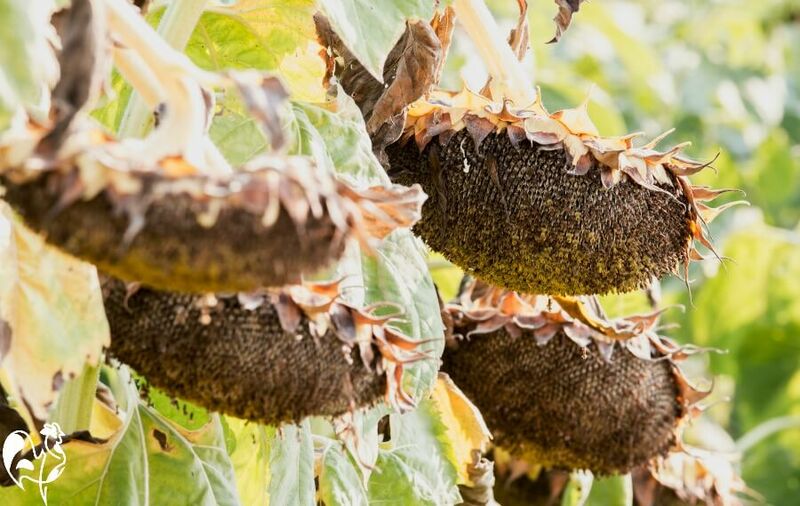 As a bonus, the seeds these sunflowers produce are large and plump - just what your chickens will love. And they produce well over 100 seeds per plant. That's the reason you'll see them most often if you come to Italy - they give the best yield per plant. You don't see these grown as a crop in Italy's fields - they're grown mostly for florists' displays. But if you'd like to add some colour to your sunflower planting scheme, there are lots of different coloured varieties on the market - this is just one of them. How to plant sunflower seeds. When you plant will depend on your area. As a "rule of thumb", plant when the danger of frost has passed. 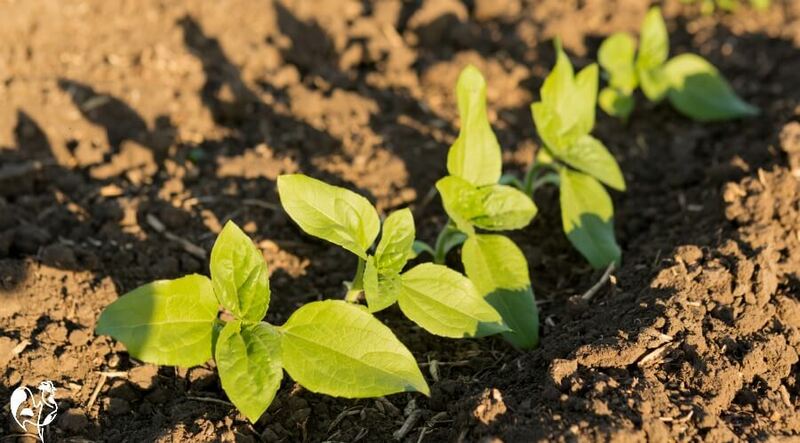 Sunflower seedlings do best in a well-drained, fertile soil and full sun. They will grow in poor soil, but the heads will be small and the plants will look scrawny. 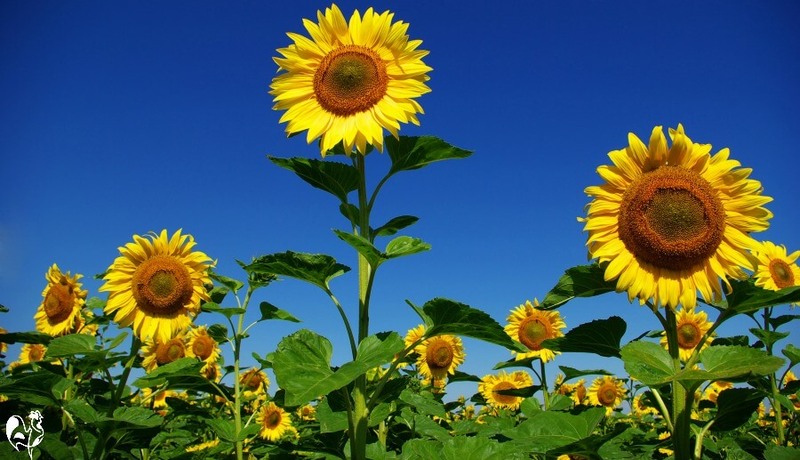 If you want tall sunflowers, plant directly into the soil, don't start off in pots. Sunflowers have a long tap root even when very young, and pots restrict it. Sow giants about 18" apart, and thin out as they grow. Protect from birds until the first couple of real leaves have grown. From now on, they're easy to grow. Water the soil when it gets dry; add some fertiliser every week if you want particularly large heads..
Water when dry. Fertilise once a week for large flower heads. For tall varieties, make sure you have canes available to stake them as they grow. Then, sit back and enjoy the spectacle. 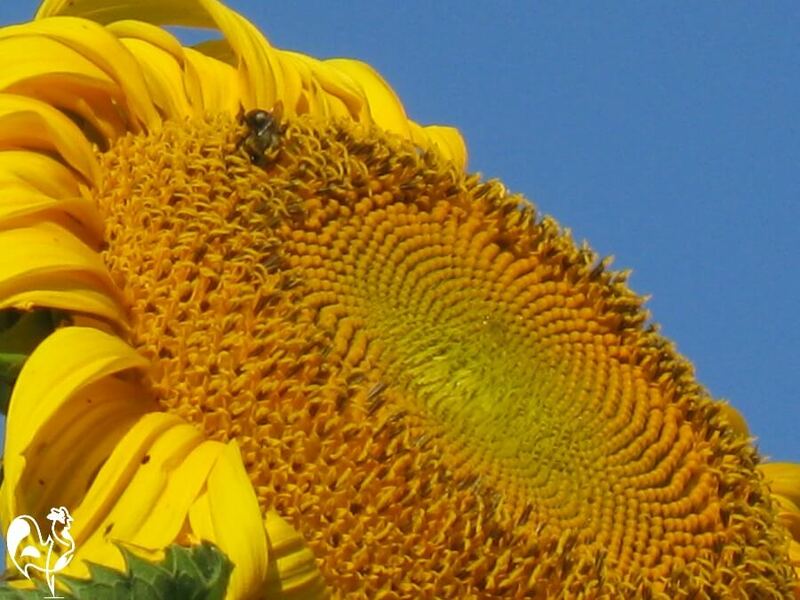 As the tiny florets on the head develop, watch out for bees collecting the pollen - sunflowers are a special favourite. 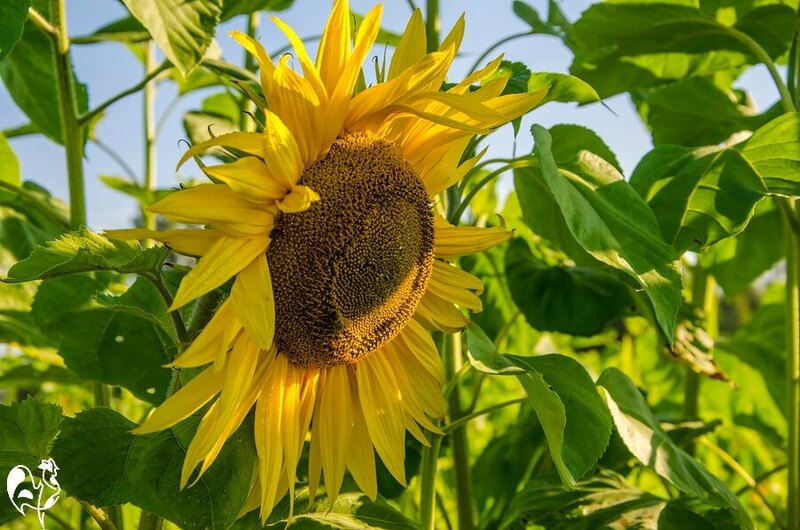 Sunflower fields in Italy are an iconic sign of summer - and we're lucky enough to have one! Sunflowers have quite a short growing season. All too soon the heads begin to droop, which is a sign the seeds are starting to ripen. In Italy, harvest is early to mid September - your timing will depend on variety and local climate. The dry seeds have the highest amount of oil, so if possible, leave them on the plant until the petals have gone and the head is hanging and completely black. 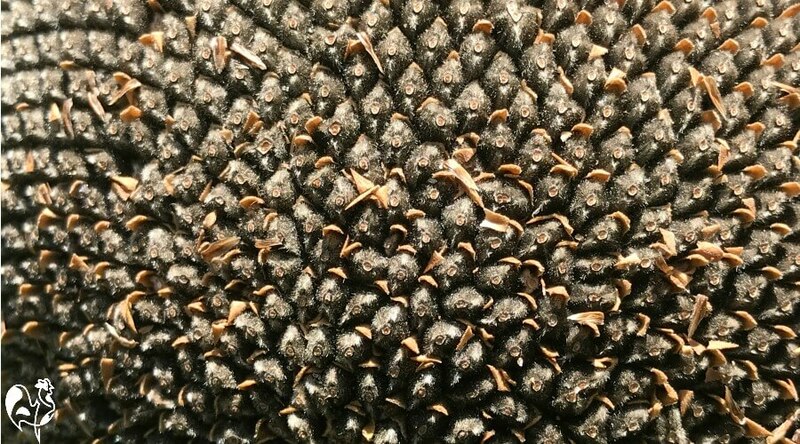 Make sure your sunflower heads are black with ripened seeds before you harvest. If you find wild birds eating the seeds, take the head off the plant and hang them inside to dry out. If you try to harvest too early, you'll find the oil will leave a black stain on your hands. It doesn't smell pleasant, either! When they're completely dried out, take the flower head and use your fingers to rub off the tiny flower heads. This sunflower is ready to harvest from our field in mid-September. Here, you can see the tiny florets standing above some of the seeds - the rest have already fallen off. Tiny florets stand above the black seeds. Now you'll see the dried seeds sitting in their little pods, all over the head. Yum! 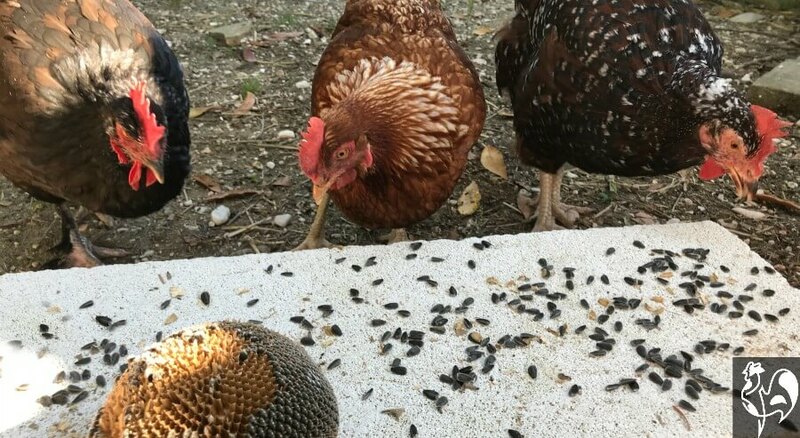 How to feed the sunflower seeds to your chickens! Your main problem will be not getting trampled in the stampede. Chickens love, love, love these little black seeds of goodness! There are various ways of taking them out of the head. I simply bang them on a concrete block, where my flock know they can find them. The seeds drop out of the head pretty easily. There's no need to chop them up - feed whole. Some of my girls realise there are fresh sunflower seeds on offer! Or you can hang the head just above the chickens' heads. They'll peck at the head, the seeds fall out, the chickens try to beat each other to get to them. Then they start the game all over again. An ideal winter boredom buster for those days when greens and bugs are few and far between. 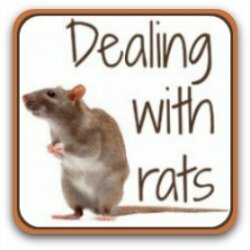 It's not only chickens who like sunflower seeds - rats and mice love them, too. Make sure you store them in a rodent-proof container. Keep them free from damp, too, or they'll go mouldy fairly quickly. Stored in a dry, cool place they'll keep for up to three months. In a fridge, they'll last about a year. 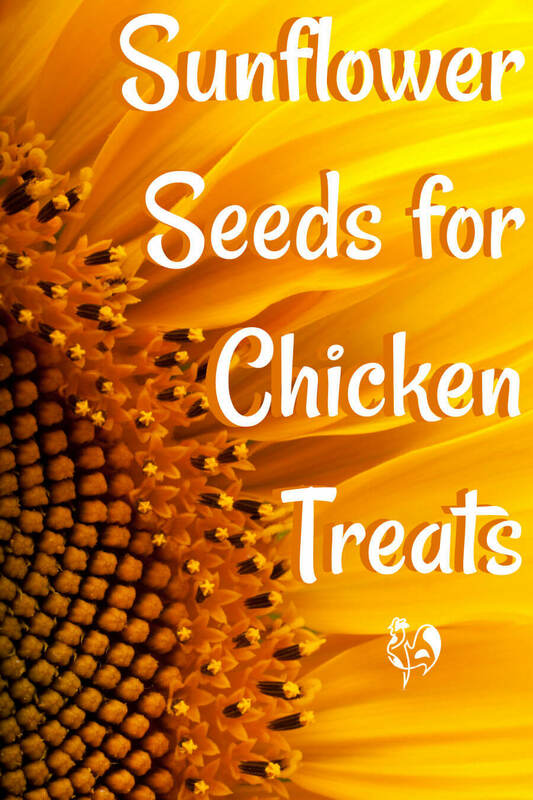 Enjoy growing, harvesting and feeding sunflower seeds for your chickens! If you liked this article, these will be helpful too. 1. Litta, G et al: Vitamin E: Vital for health and performance. Pub. Poultry World, 2014. 2. Senkoylu, N and Dale, N: Sunflower meal in poultry diets. Pub. World Poultry Science Journal, 1999. 3. 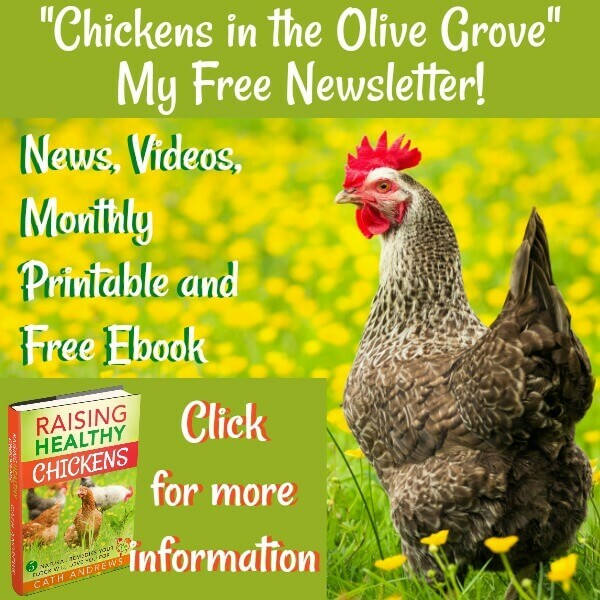 Balnave, D: The importance of linoleic acid in poultry diets. Pub. Australian Livestock, 1981. 4. Rebole et al: Effect of dietary high-oleic acid sunflower seed... on broiler performance. Pub. US National Library of Medicine, 2006. 5. Jacob, Dr J: Using sunflower seed in organic poultry diets. Pub. University of Kentucky, 2014.